Launched commercialize a PIPA (Product Name HPTH59) as an optimal probe for telomere staining. 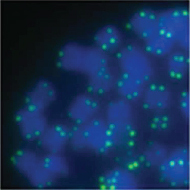 The present fluorescent labeling HPTH59 is nuclease resistant and enters into cell nuclei without any delivery systems and direct visualization of telomere is possible. Comparing to the other methods, such as telomerase based antigen-antibody reactions, Southern blotting and/or PNA-fluorescence in situ hybridization (FISH) method, the present probe can offer simple with lower background staining.